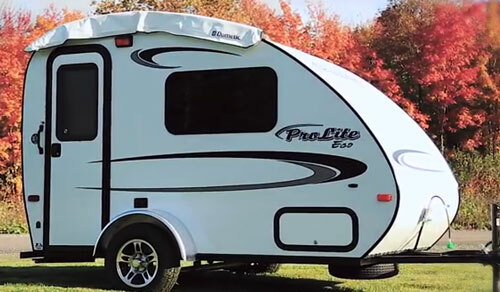 Prolite’s Eco12 fiberglass mini-camper offers the best of its class: lite and durable design, useful features, good interior headroom promises comfortable camping experience…. 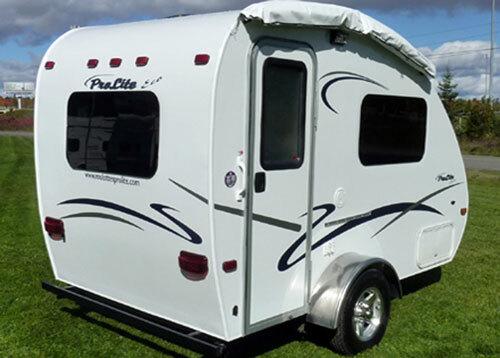 ProLite is a Canadian RV manufacturer operating in the Province of Quebec (St. Jerome). The company offers a series of fiberglass travel trailers ranging from the smallest one Suite (length 11’10”/ dry weight 550 lbs) to Xtreme (length 24’4” / dry weight 3,700 lbs). And just for completeness - they also offer class-B motorhomes. While the Suite trailer is undoubtedly the lightest ProLite model, due to the lack of essential features it is rather a hard-walled shelter on wheels than the camper you would like to use for your adventures. That is why we propose here the next in the series- Eco 12. Just 1 foot longer and a bit heavier, with dry weight of 750 lbs this travel trailer clearly belongs to the class of mini-campers. However in difference to Suite, the Eco 12 is generously equipped with features that will make your camping experience not only memorable but also comfortable. Actually, given the small size it is amazing how well the Eco12 was engineered. The interior houses large dinette with benches on both sides of the table. 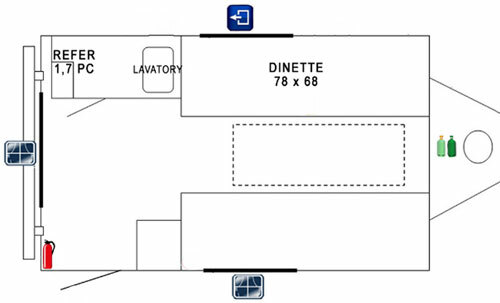 Depending on chosen option, the dinette can be converted to either queen-size bed (68”x 75”) or two single beds. Under both seating benches there is the storage space (one also accessible from the outside). The galley seems to be reasonably equipped with built-in 2-burner cooktop, single-bowl sink with faucet. The water pump integrated into faucet supplies water from 15 gallons fresh water tank. Optional 6 gallons DSI water heater makes “things” even better. The real treasure is located below the stove in the maple cabinet. Believe or not, you will find there the 3.7 cu. 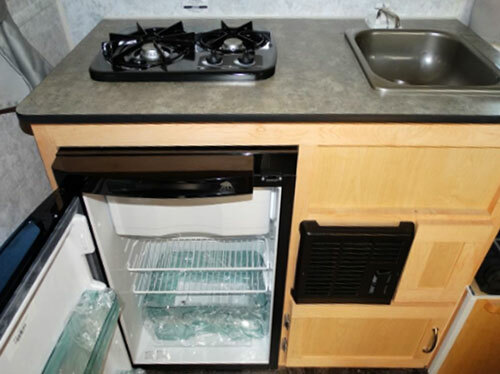 ft, 3-way refrigerators w/freezer as the standard equipment. 20lbs LPG tank mounted on the hitch completes the “picture”. The kitchen cabinet houses also 16,000 BTU furnace w/thermostat – an understandable feature knowing that the climate North of 49th parallel is “more demanding” (to say it nicely). Next to the entrance door there are full-height maple-door cabinets offering generous (and elegant) storage space. Frankly, there are probably just few so-mini, so-lite and so-roomy and well equipped travel trailers on the market. Certainly ProLite Eco 12 is one of them and what is also important, it can be towed by almost any subcompact 4-cylinder car. Obviously mini-campers do not offer residential-like comfort. They are not even designed to offer living area where you can spend quality time in the case of bad weather. It is assumed that you will enjoy the nature during a day and then come back to the camper to make some meals and then take a sleep. That is why, most mini-campers are made in teardrop-shape. They provide what is mostly needed including sleeping area and rear-access galley. But all of them have small interior headroom allowing only for “crawling”-like movements. The ProLite Eco12 with the headroom of almost 6 feet is a nice exception offering much needed “living space”….